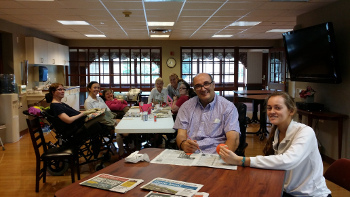 Volunteers are an integral part of The Beechwood Home. Without the contributions and generosity of our volunteers, it would be impossible for us to provide the variety and quality of programming we offer our residents. If you would you like to share your talents with our residents, or if you are interested in participating in our activities and events, we’d love to have you. Our volunteers interact with our residents in a variety of ways. From gardening to crafts to playing games, we appreciate the many contributions that a volunteer can make. Simply spending time with our residents in the outdoor courtyard or reading the newspaper with them can make a significant difference in their lives. Many times our volunteers have skills and talents that staff members don’t have, such as singing or playing a musical instrument. Nothing makes our residents’ day or provides a sense of community like enjoying these forms of entertainment.